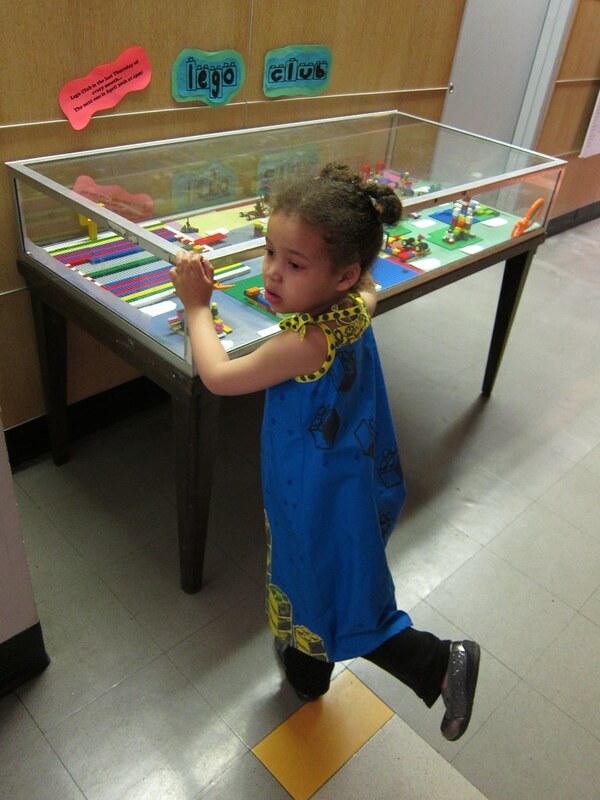 What with all the Small Human Being-focused sewing going on, I think my daughter was feeling a little left out. So I pulled out one of the unfinished (unstarted?) 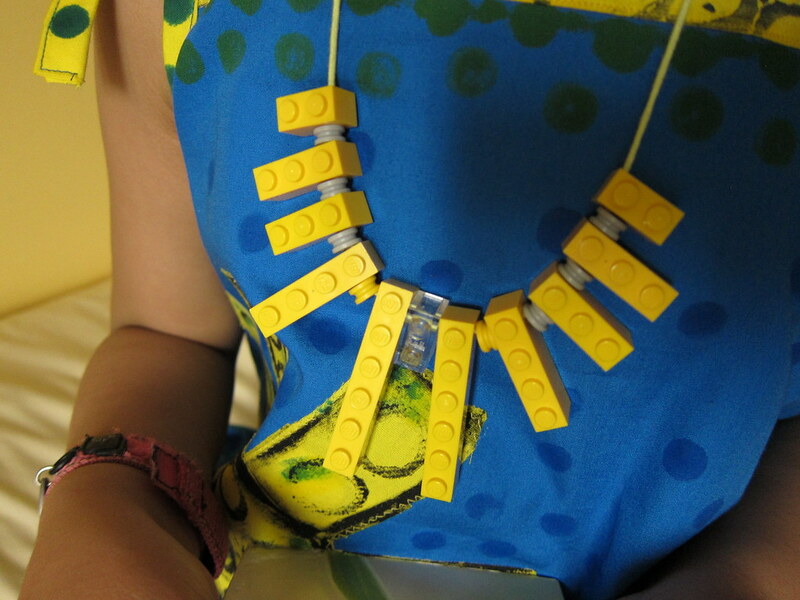 objects I felt most guilty about: her Lego Cityscape sundress. 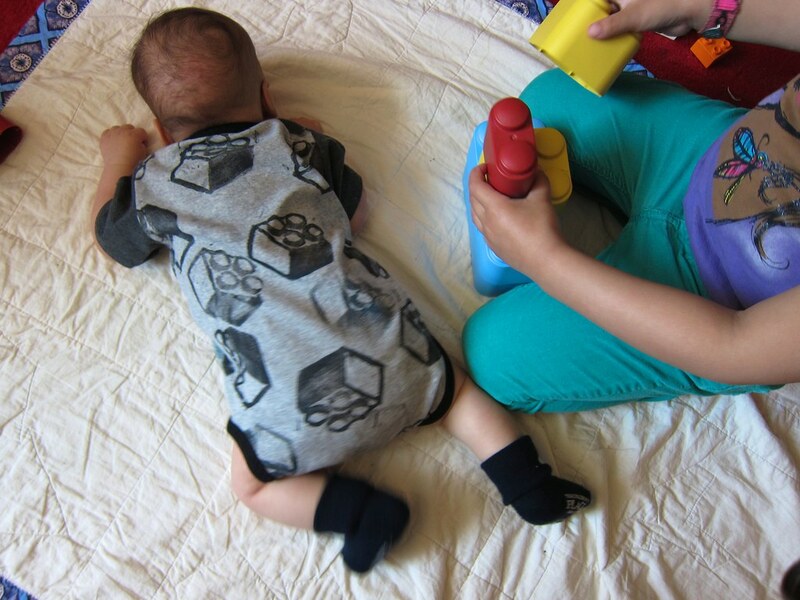 I sort of meant to make it for Kids Clothes Week, but baby wasn't really napping, and I fell down the crafty rabbit hole of experimenting with block printing and... well, here it is. She loves it, if it isn't obvious. I really struggled to edit down the photos on this one! 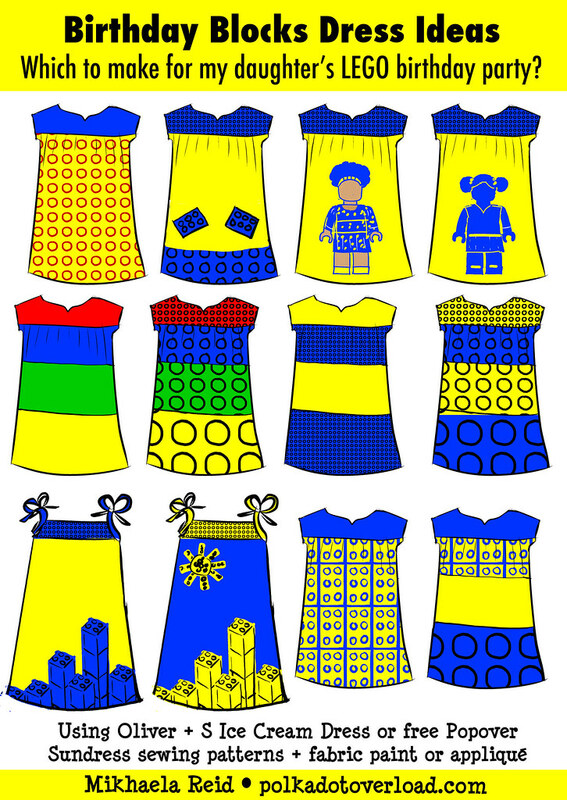 Backstory: As some of you may recall, about a year ago, I had a little "Lego Dress Showdown" to choose which blocks-themed dress idea to make for my daughter's Lego-themed fourth birthday party. The other kids came and played with all the Duplos and games we had set up, and we recorded a video of them singing happy birthday to her and wishing her well. She recovered by the evening but is still sad about missing her birthday party to this day. But I digress. Back to the dress! 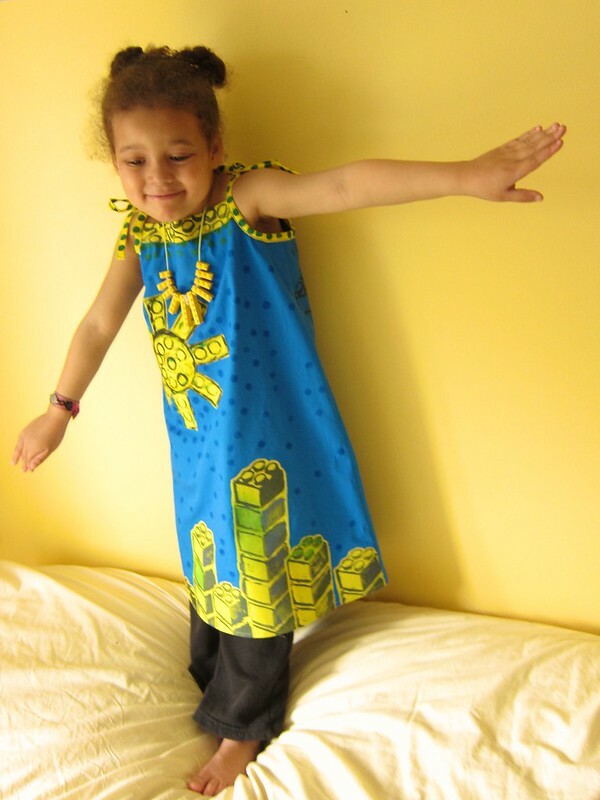 The pattern: The Oliver + S patterns free Popover Sundress pattern. I actually own a bunch of not-free-at-all Oliver + S dress patterns, but I went with this free shoulder-tie dress because it is so simple — the plain front makes a great blank canvas for embellishment. 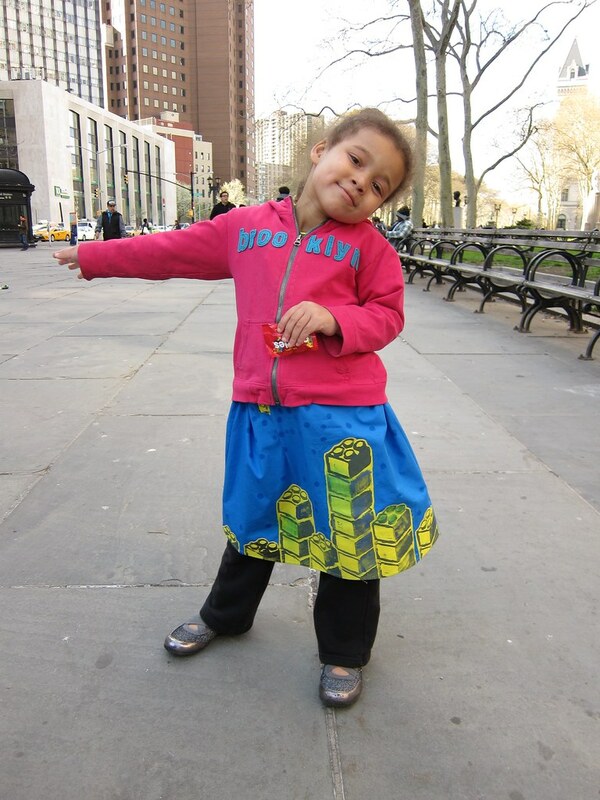 It was a fun and quick sew, and the directions are just as great and detailed as with their paid patterns. My only quibble is that there isn't much ease across the tummy; if I make it again, I'll add some width and gather or pleat the dress front to the yoke. 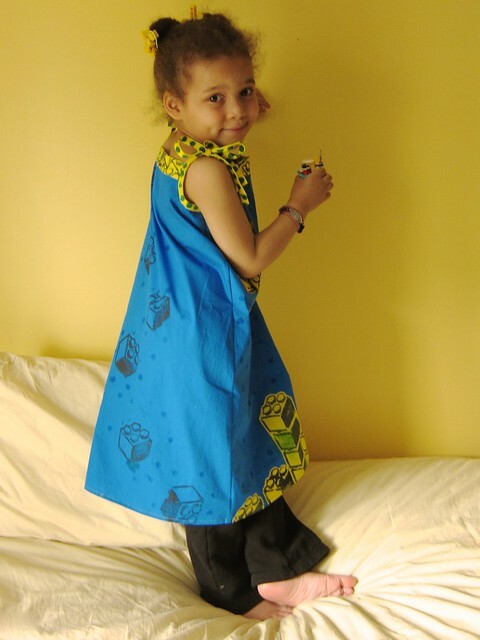 Sizing: I made the size 7 (probably about two sizes too big) as I'd like her to be able to wear it for a good long while. Fabric: Bright blue and yellow broadcloth from Tru-Mart Discount Fabrics (a crowded little store over by FIT that has some great deals sometimes). Notions & tools, etc: Steam-A-Seam Lite 2 (for the appliqué). 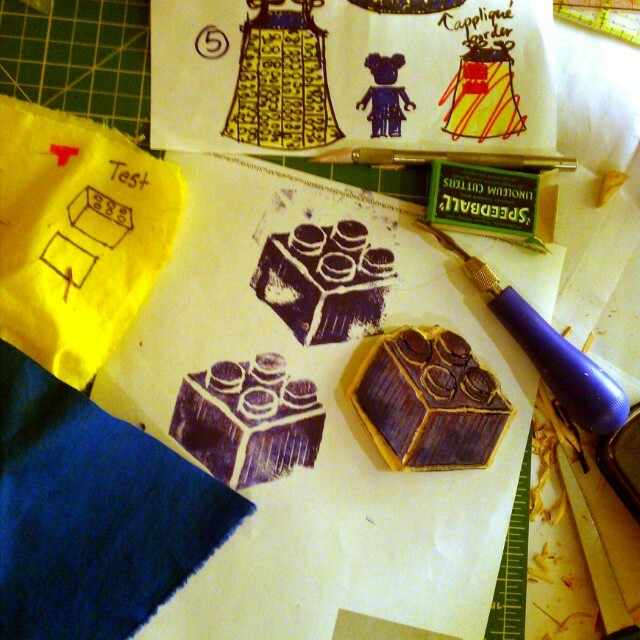 Fabric paint (Jacquard Neopaque nontoxic paints, which I already had around because I am a craft supplies semi-hoarder), Speedball Lino Cutters, Tee Juice Classic fabric markers (for the dots), some Blick EZ Cut block printing material, a foam brayer and foam brushes. Blockprinting references used: I already had Lotta Jansdotter's Lotta Prints: How to Print With Anything From Potatoes to Linoleum... which is very inspiring, but slightly vague on the technical info and handholding needed to get good results. Luckily my local library had a more nitty-gritty detail book available, Fabric Printing at Home by Julie Booth. Techniques used: Mock French seams (my first time trying this), homemade bias binding (for the straps) with a Clover 1" bias tape maker. 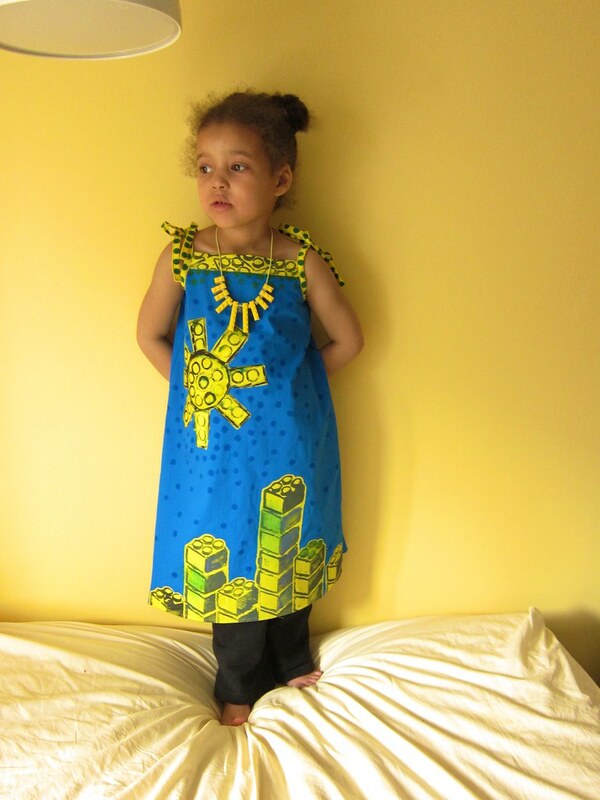 I had a moment of panic when she tried it on and declared it resembled an IKEA apron (the yellow and blue?) but once I added the dark green polka dots with a Tee Juice marker, the resemblance faded. 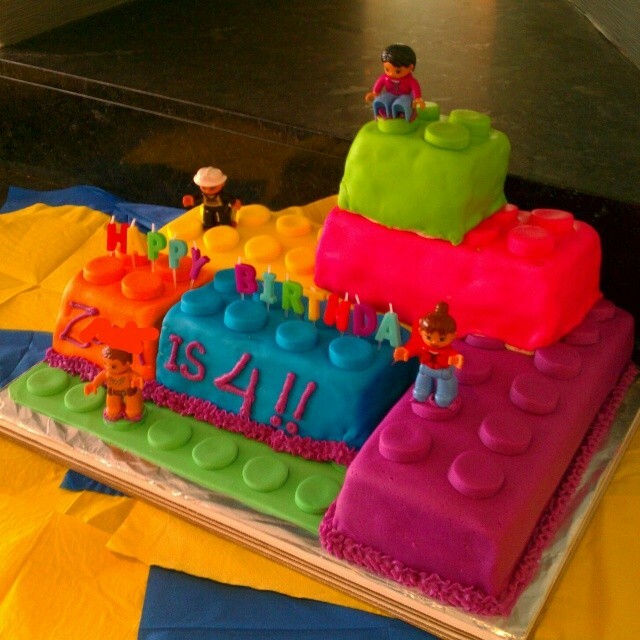 The librarians loved it and invited her to the monthly Lego Club. She had a blast building a "Flying House Pirate Ship" with some mermaids and wizards on it). 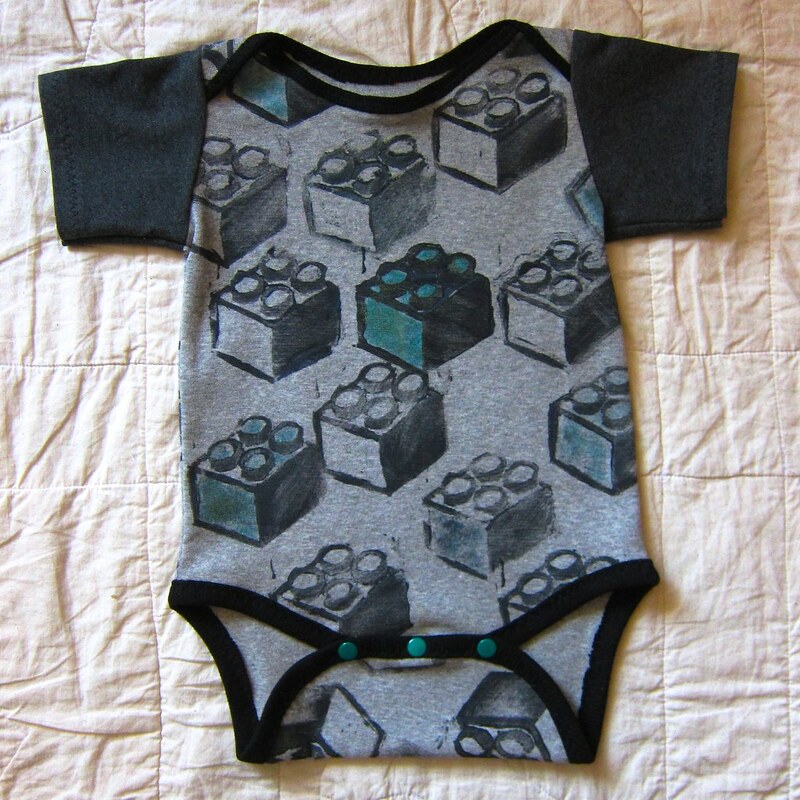 While I had the paints and block out, I decided to make a blocks onesie for the little guy as well using my Kwik Sew 2433 baby layette pattern and some random knit scraps left over from other projects. I made the 9-12 month size, so it's HUGE on my 3-month old, but he's growing fast. Conclusion: Neither garment is perfect (but whatever, perfect is the enemy of good, etc), but I had a lot of fun and feel like I learned a lot in my block printing experiments and am now a bit obsessed with thinking about how I can decorate my own fabrics. While at the library I also picked up A Field Guide to Fabric Design: Design, Print & Sell Your Own Fabric (Traditional & Digital Techniques) by Kim Kight (formerly of True Up blog, now a fabric designer for Cotton and Steel) and it made me want to experiment more with Spoonflower again. (We'll see if that actually happens). 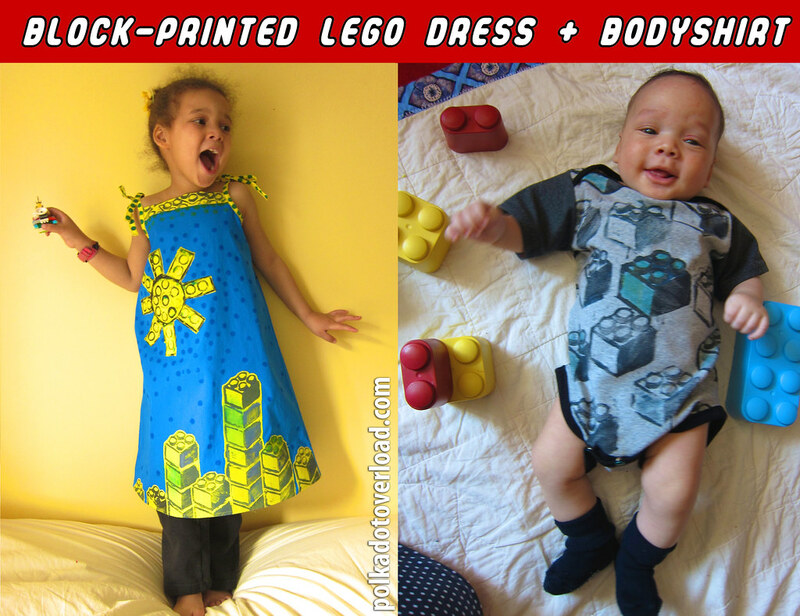 In the meantime, Z is loving her Lego dress, and I am thrilled that I finally finished it. **Disclosure: Actions you take from hyperlinks within this blog post may yield commissions for polkadotoverload.com (quite likely to be spent on yarn or fabric or possibly diapers). Bless her missing her own Lego party! 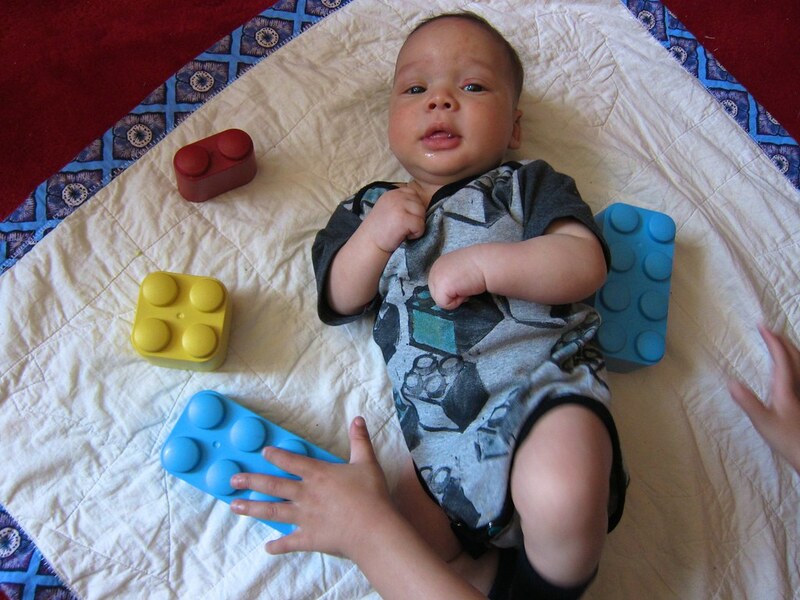 My kiddos LOVE Lego. Going to show them this post later. 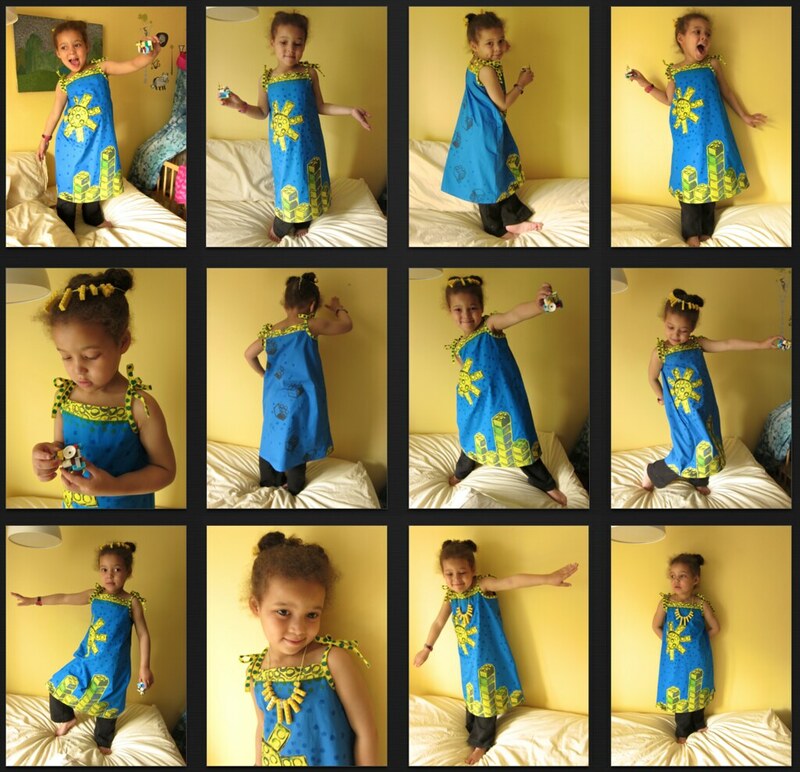 Z looks fabulous in her Lego dress. Aww, getting sick on your birthday is rough. I got the flu on my 7th birthday, and to this day I still think of it as my worst birthday ever. The outfits are both fabulous! 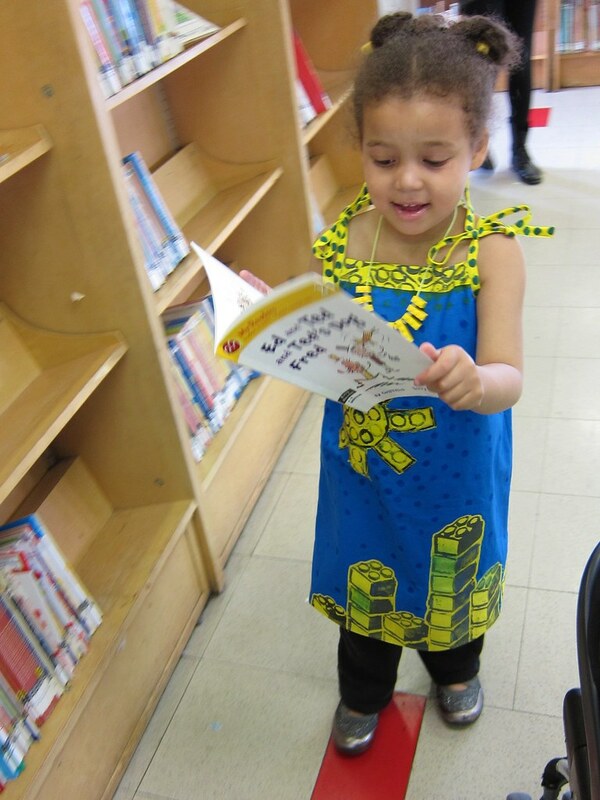 What a neat dress and I especially love the onesie! That's an amazing dress! So sorry about the missed party and sick Z.
I like the onsie too. Sometimes it's so hard to find "cute" stuff for boys and you've gone and made your own. Well done! Ahh, I love it! And because you did all the printing yourself, you truly have ownership of the design. That's awesome! My concentration in college was actually printmaking (art ed major) and I did a ton of block printing that final year. Though I've only done a few block prints on fabric. Love it so much. It is a work of art! 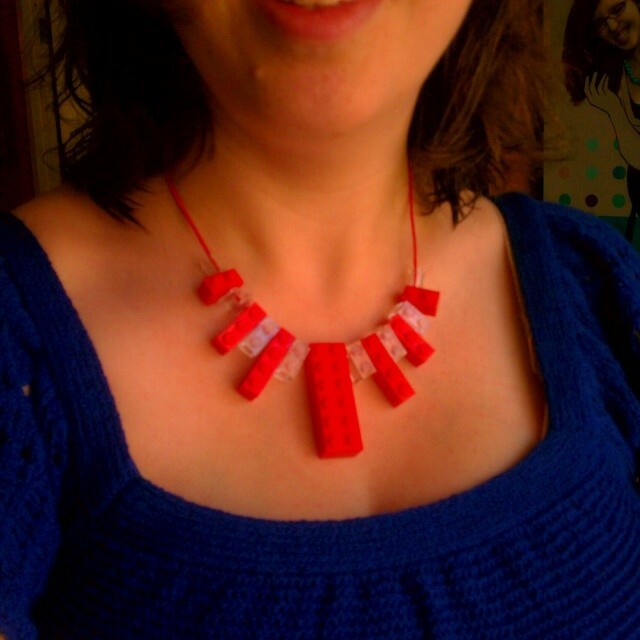 They both turned out so great, and the Lego necklaces are so much fun! 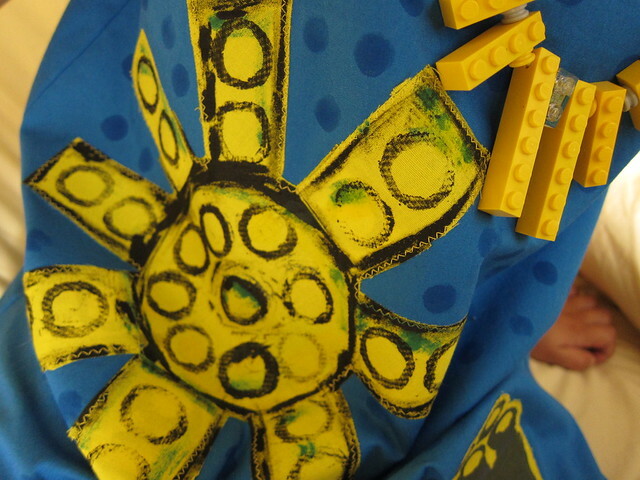 I love that the blocks on Z's dress are appliques--texture plus block printing! Between you, and Marilla Walker, and Deepika's wood block printing, I'm thinking I need to give block printing some quality time soon...it's been too long. I had the same experience with Lotta Jansdotter's book; it's so inspirational, but not super helpful with technique. I found a surface design at the library a couple of weeks ago, but the title and author escapes me as I filed it under my--not this moment right now. SHB Giveaway winners coming soon!